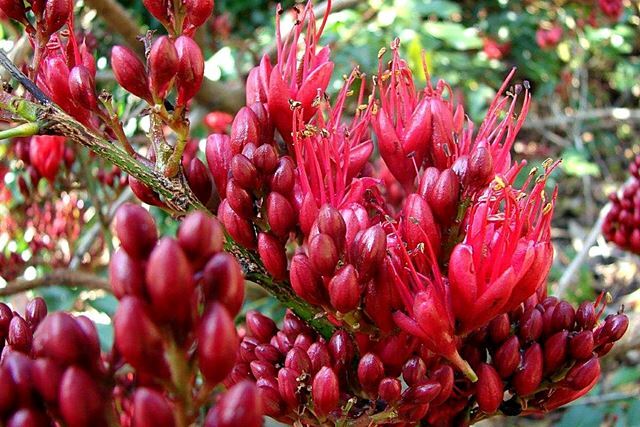 The Weeping Boer-bean or Huilboerboon (Schotia brachypetala) occurs from Zimbabwe and Mozambique in the north to the Eastern Cape in the south. It is a medium to large tree with a wide-spreading, densely branched, rounded crown. It has a single trunk that sometimes branches low down. 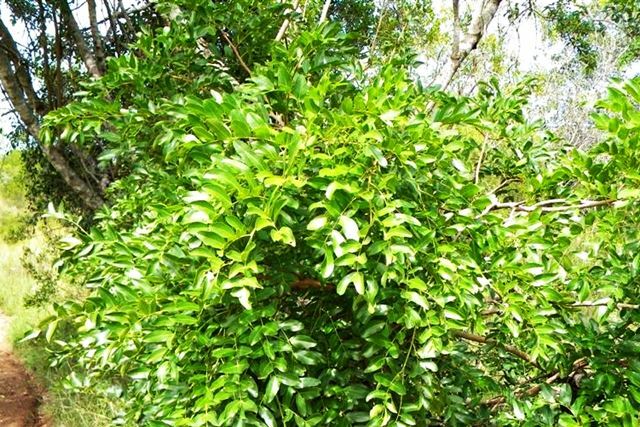 Huilboerboon trees can reach a height of 22m but most commonly grow 11-16m in width each with a spread of 10-15m. The bark is rough and brown or grey brown. The leaves are compound, with 4-6 pairs of leaflets, each with an entire, wavy margin. The foliage is reddish to coppery when young, turning bright green and maturing to a glossy dark green. In warm frost-free areas this tree is evergreen, but in colder regions it is deciduous, losing its leaves for a short period in winter to spring. The flowers are rich deep red, and are produced in masses, in dense branched heads on the old wood during spring (August-November). The flowering time is somewhat irregular in that a tree in bloom may be a few metres away from one that has no sign of flowers. The fruit is hard, flattened, woody, dark brown pod containing flattened pale brown approx. 20mm diameter seeds with a yellow aril. The Weeping Boer-bean (Huilboerboon) also has a number of other uses; a decoction of the bark is taken to treat heartburn and hangovers. Bark and root mixtures are used to strengthen the body and purify the blood, to treat nervous heart conditions and diarrhoea as well as for facial saunas.